Recap – August 2018 : Squad – Communicate. Coordinate. Conquer. Welcome to the August Recap! We’ve got some of the fresh cuts from the upcoming Alpha 12 to show off today! And heads-up, Offworld is off on a company holiday right now, but we’ll be back fully recharged, team-built, and ready to take on the world again. We don’t want you to miss us too much, so be sure to check out the latest SquadChat to hear the sweet, soothing tones of Axton and Chance. We chatted about mapping, getting into the industry, and took your questions. We’re in a stage now which we call “hardening” where all major features going into the next version are locked down and we’re searching and squishing bugs as they come. Internal playtests have also started in order to put these new features and gadgets through their paces. 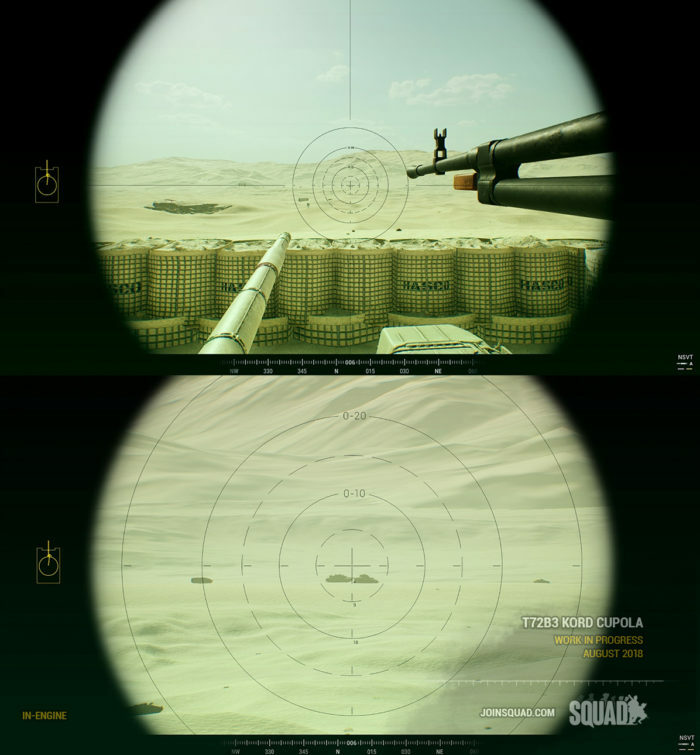 This process will take some time as there have been a lot of new additions to the game that will need to be properly tested and polished, but we believe that it’ll be a major upgrade to the game that you the player should be accustomed to with each and every new alpha version of Squad. We’ve finally managed to get the Russian counterpart to the American Abrams into the game and in testing. The T72B3 will be the main battle tank for the Russian ground forces, has a 3-man crew (Driver, Gunner and Vehicle Commander) and features a stabilised 125mm smoothbore cannon fed by an auto-loader. The cannon can fire a dizzying array of different ammunition types ranging from armor-piercing sabot rounds to high explosive anti-tank, anti-infantry fragmentation rounds and even the 9M119M Refleks anti-tank laser-guided missile. In addition to this large arsenal to its main gun, the gunner has the usual 7.62mm PKT coaxial machine gun and smoke grenade launchers. In comparison to the Abrams, the T72B3 is a much lower profile tank, almost 2/3rds the height and weight. Its autoloader is slightly slower than a human loader, and also presents a vulnerability with the ammunition stored directly below the turret. The Vehicle Commander has control over a 12.7mm Kord machine gun in the cupola and has access to the turret’s smoke launchers if need be. The user interface has made even more strides since last time we showed this off, and we’re going to show just how many new features we’ve added to the command experience. We’re introducing a new “Command UI” interface which is accessible by all players. This features a large widescreen map and filter buttons that allow you to do things such as toggle player icons to be their roles, toggle FOB radius circles, viewing the map icon legend and a few other quality of life features. You have the ability to highlight any squad member or team member from the Squads list and they will be highlighted on the map. You can also highlight by Squad simply by selecting the squad’s header from the Squads list too. In addition, selecting players on the map will also highlight them in the Squads list. We’ve designed a new right-click menu for any players in command positions, accessible in both the Deployment and Command menus. This menu has been expanded upon compared to the old hex menu in that it has a logic now to icon and marker placement and layout, as well as allowing us to add a few more team-wide request markers that should be useful for team-wide communication. In addition, we’re adding a “Waypoint” marker system that allows players to quickly drop at least 3 team-visible markers, which include a way to identify the squad that placed that particular waypoint marker. Fireteams can be organised in the Squads list now by simply dragging the member you want to assign, and dropping them into the desired fireteam. You can also right click and assign them through the context menu that pops up. Our CEO finally deployed the rally point and we’re all deploying for a company trip roughly during the first week of September. For this time, most of Offworld Industries will be out of office, getting to know their international teammates and plotting for the rest of the year. When we get back the fresh assault on bug-smashing begins! Response times from us may be a little slower during this time, so hang in there! We will get back to you. We appreciate your understanding! We’ll be back next month with more! Alpha 12 is going to be a pretty big one, so we’re looking forward to getting into playtesting with you all!